Some of you might not know that in her spare time Rachel is an artist. 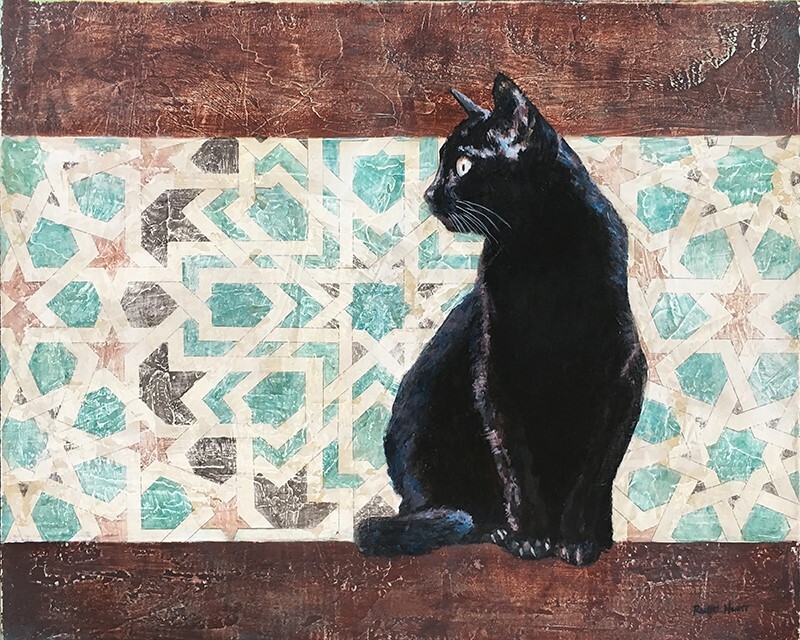 She paints mixed media paintings incorporating two of her favorite things: animals and patterns. Her paintings are available for purchase, and she also offers high quality giclée prints on canvas of any of her artworks. We’ve decided to start featuring one of her paintings each time we send out a newsletter … after all, what better to warm up the walls of a home than original artwork? You can purchase prints of her paintings through the website she shares with her father and sister, and you can contact us directly to inquire about purchasing an original. Enjoy – and feel free to reach out to us if a painting catches your eye! We had to put George down this year as her little body was failing her. She had been an incredibly sweet and funny girl and we loved her and miss her dearly. She was both strikingly beautiful and a total goofball. Rachel painted this painting of her against a colorful Moroccan background. George, this one is for you.